Please call owner Tom at 231-631-4613. Boat is in Arcadia, Michigan. 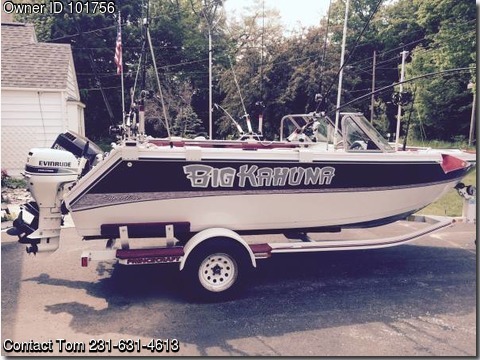 Beautiful boat with walk thru windshield ready to fish. Excellent condition stored inside year round. Mooring cover and boating covers. Features: Evinrude 150 HP (2 stroke). Evinrude 15 HP(4 stroke) kicker with TR-1 Autopilot. Lowrance Global Map 2000 with Sonar, GPS and Mapping. Big John Planning Board Mast with Otter Boards. 2 Big Jon Downriggers Captain Packs. 2 Big Jon Rod Holder Sets of 3. 2 Live Wells. Trailer included, does not use a surge brake. On board 3 station battery charger. All tackle required to get you started. Rods, reels lures and net.